Happy memorial day weekend, yall!! Do you have any fun plans? I'm so excited because at my new company (2 weeks in!) we have a 4 day weekend instead of just 3! So I'm totally enjoying today off and going to yoga and running a few errands that I've been putting off. Then War and I are going to see The Revivalists Saturday night and perhaps head down to Santa Cruz/Capitola if the weather is warm enough on Sunday. Although I wish we had planned a trip, it will be nice to relax and just enjoy the weekend! In other news, did you know it's Nordstrom's big half yearly sale?! 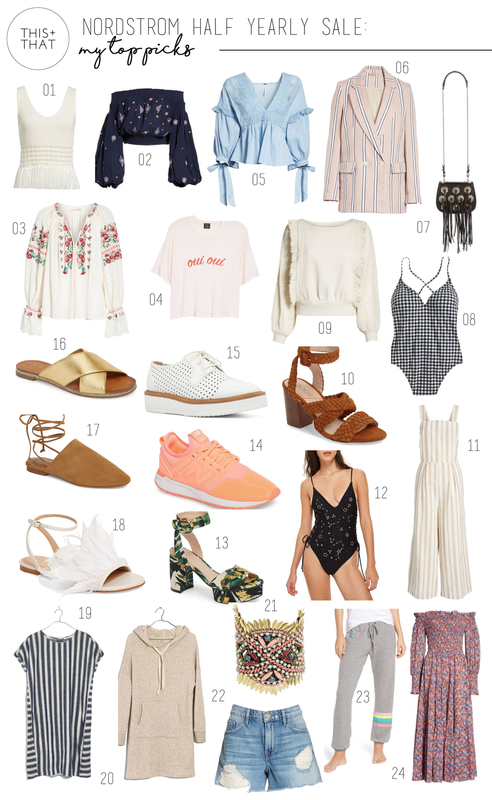 I went through all 258 pages of the sale (yes my thumb hurts from scrolling through them all haha) and rounded up my favorite picks! I purchased these sandals (would look so cute with this dress!) and thinking about getting this top. And although I dont really work out in tennis shoes (yoga girl haha) I'm thinking I just need these because it's my favorite color combo!